It baffles me that this place has been vacant for so long. Federal/Joyce basically bursts at the seams some nights, and Brightleaf is doing well. I've seen pictures of the building when it housed Goody's. Do you know what kind of store that was? I used to fantasize about buying this building for mixed use: retail on the first floor and office or apartments (i.e., MY apartment on the second floor with the south and east facing windows) and a rooftop garden. The scuttlebutt I've heard in the last couple of years is that (a) the owners are a group of siblings who aren't easy to get onto the same page for a decision and (b) the owners are asking for more money (~$750k as of a year ago) than the place is worth, given the amount of refurbishment that the roof needs. Wait... Jo and Joe's closed? Permanently? Dan: it is rather baffling - see my response to Phil below. I don't know anything about the Goody shop, and i haven't had time to research it. If you know how I could get that photo added to this post, please let me know. Phil: How amazing would it be to have some mixed-use presence along Main St. here? The scuttlebutt you've heard matches what I've heard - the Julian family (as in Alexander and Chapel Hill) owns the place and have unrealistic expectations/lack of consensus. Mr. R: Yes, unfortunately. A family issue evidently prompted a quick sale. It seems there will be a restaurant presence there still, and the rumor on the street is that the owner-to-be wants to attract more of a student crowd with an Irish Pub or a sports bar. Rah. I give that about 3 months. Wow, that is really sad. J&J's has been one of our favorites in the year or so that we have lived in Durham. Anyway. Since I am writing, I should mention that, although I have never commented before, I always read this site. Being relatively new to Durham, I appreciate getting an insight into the history here (as upsetting as it may be to see a beautiful old building that has been turned into a parking lot). Thanks for the hard work. Anyone else remember the coffee shop / poetry place here in the late 80s? It was the hangout of a certain Duke philosophy professor, who was renowned for his ability to seduce female undergraduates. wrecked, absolutely wrecked, re: J&J. 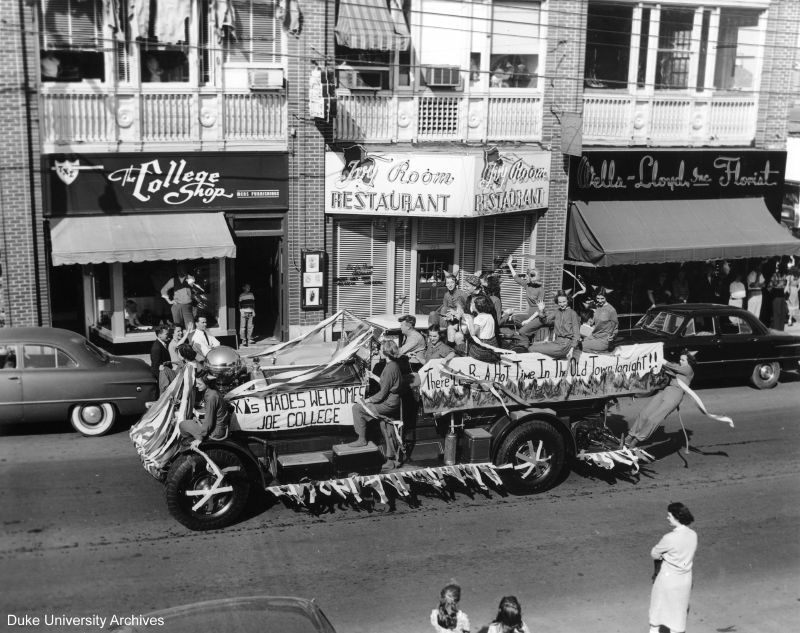 i really believe it was a major keystone of downtown revitalization, along with Ringside. and i also agree that just another Irish pub or sports bar simply won't fly there. it's easier and more "hip" for students to go to one closer to campus, or with easier parking. J&J's was about community. Joe and Jo's was like home, very sad. Thanks for the memorial. Do you know anything about the building for sale on Roxboro and Main? (the old Health building). Looks like the County is selling it. Maybe they have been for awhile - I just noticed the sign last week. If that came alive, it would enliven the whole corner there. Yes, it's sad news about Joe & Jo's. My understanding is that JoAnne's father has fallen very ill and that she's left Durham to be with him. 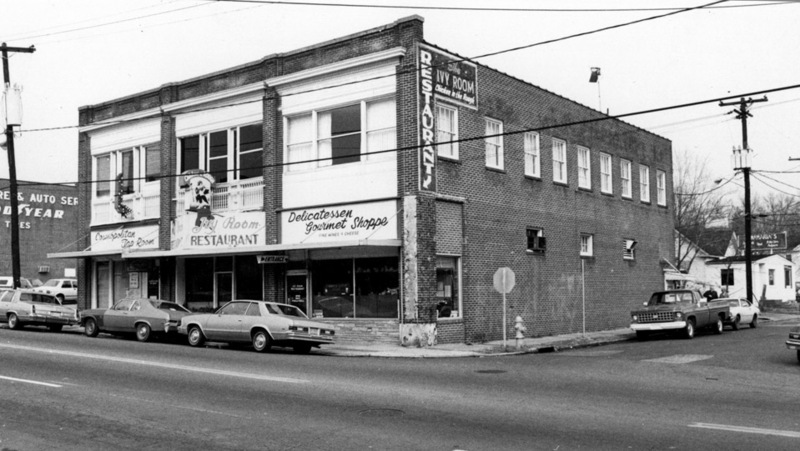 Along with Ringside, Joe & Jo's really was one of the first west-side-of-downtown Durham venues to be open in the evening. I remember walking from Ringside back to Brightleaf on a Wednesday night, and being hailed by the newly opened Joe & Jo's. "Hey! Come on in!" We didn't check in that night because we were all full and/or in a hurry, but we went back soon enough. Back in the early 90s there was a briefly-lived Japanese place that served dinner on weeknights ~where the Jerk Pit used to be (i.e., ~where one of the Latino lunch places currently sits). It was an elegant restaurant and I absolutely loved their fried tofu which had a light, semi-crispy crust. Dang, that was good. I wonder where those folks are, now. Jo and Joe's is quite a loss - felt like a very genuine spot, and the kind of spot that you really build upon for downtown energy. Of course, the New Orleans Cookery, which occupied the Jo and Joe's location back in the mid 90s (and enjoyed quite a following) seemed to be 'that place' as well. I think they had even opened up another in Chapel Hill when a nasty problem of not paying taxes of some sort popped up. I've had all these things I wanted to say about the Ivy Room, and I've never gotten around to saying any of them. But I still have a t-shirt from there, and probably still have a card from them that says something like "It's fun to be nice to people." And almost 20 years later, their closing still rankles. I remember that they opened another store somewhere not very close to the center of town, but I have no idea exactly where it was. I was told today that this building has finally come up for sale -- perhaps propitiated by the impending development of the McPherson property. I don't know any other details, or even how to check into such matters. As of October 2007, this space is actively under renovation. The whole front, unfortunately, has been torn off, so I'm nervous as to what architectural direction they're going with. It was pretty rundown, so hopefully it's just due to repair decay. I've lived on Gregson St. for over a decade, and this is the first life I've seen there, aside from Pizza Hut struggling there for a bit. And what IS the deal with Gatsby's?? Geez, Louise, people! You've got parking and visibility, what's holding you back? I remember going there as a little girl. Yes, so sad when the closed. And I forgot about the "it's fun to be nice to people" quote. So fitting...sigh. Not to contradict the posters above, but I believe the Ivy Room slogan was, "It's nice to be important, but it's more important to be nice". Oddly, that's about all I remember about the place. I spent more time at the Cosmo Tap Room next door. The Ivy Room's 'motto' was "Its fun to be nice to people" . I had a t-shirt with a picture of the building and that quote on it.. My first job out of college was working there, great memories. Cool post and cool site. Thanks for this. I used to go to the Ivy Room and also the Cosmo Tap Room in the late 70s early 80s. Have a photo of the Ivy from that time (outside), will have to dig it up. 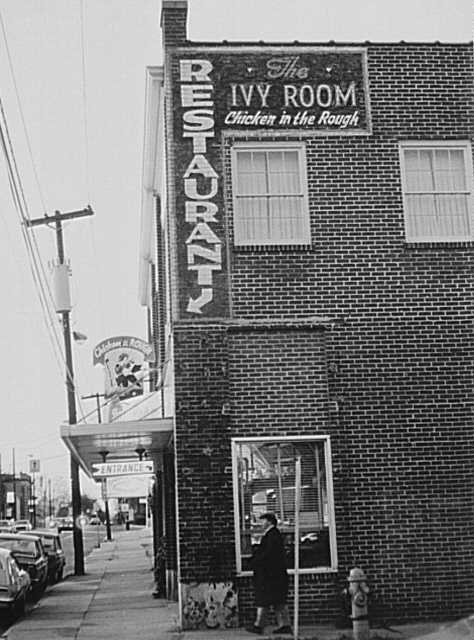 Finally posted a March 1986 photo of the Ivy Room from its side, similar to two shots featured here. Hey guys I am proud to be in a space with such history. I hope that the new generation of businesses will again bring color and life to this beautiful building. I have been told that the Ivy Room was notable for early integration and for being "the only place in Durham to get a bagel". Can anyone verify this? I really liked the Ivy, they made the best bread pudding in the world. The top photo from the air shows an almost square very small building just west of the Ivy. It has to be the Donut Dinette. Just big enough to get in the door, a few stools at the counter. You could watch the donuts cooking and being glazed. Man were they good. Maybe only Britt's at Carolina Beach could be beter. Can't remember when it left, maybe early 60's. Anyone remember it? I'd love to see some pics. Our company has just signed a lease for the whole top floor of the building to relocate our Triangle area corporate headquarters from RTP to Downtown Durham. Move-in is scheduled for 1 October 2010. For over 39 years we've been assisting governmental and non-governmental agencies in designing, implementing and evaluating health issues in over 30 countries. Our downstairs neighbours will be Nomadic Trading Company, Uniquities and FiFi's Fine Resale Apparel. I have had the pleasure ( and it was indeed a pleasure) to frequent the Ivy Room. It was a special place. Anyone could feel comfortable there. It was full of southern charm, Durham ambiance, and good food. I left Durham in the early 70's. On my return to NC in 2008 I was looking forward to visiting the Ivy Room again. How disappointed I am that places such as these fall to the way side for pizza parlors, and store front boxes. When I was in high school during the early '80s, my friends and I would eat dinner at the Ivy Room regularly. The most notable employee there was a short, very southern waitress with snow-white hair that she piled high on her head in a beehive. She wore thick pale pancake makeup on her face, and clownish eyebrows that were painted on her face in a very dark shade of green. She was quite striking, and really a Durham icon in her own right. Just this past year I was eating dinner at Pool's Diner in Raleigh, there was a terrific b & w portrait of her for sale. I regret not buying it. The best story I have about this waitress was that the year after I graduated from high school ('85), I was working at Anotherthyme Restaurant right around the corner, which was pretty much the trendiest restaurant in town at the time. We had a big Halloween party at the restaurant that year, and one of the young waitresses came dressed as the Ivy Room waitress for Halloween. She served customers all night in that getup. It was brilliant. 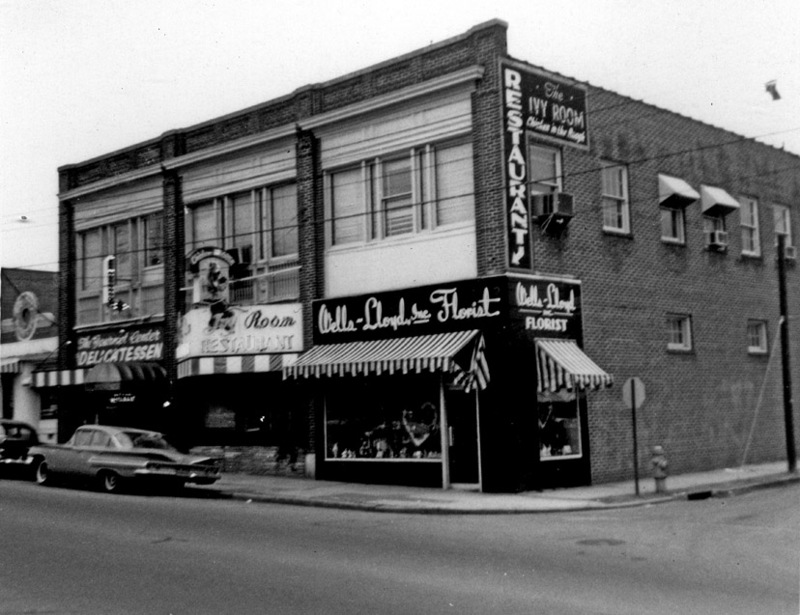 I worked at the Ivy Room in 1979 and it really was the first place in Durham where you could get a bagel. A man from NY, (I can't remember his name to save my life), purchased the restaurant from the original owner. He brought in bagles, NY cheesecake (flown in every day) and a deli. If I'm not mistaken the Ivy was the first resturant in Durham to have a full service bar. We always had a hard time finding a bartender because there were none in Durham. I always worked the dinner/late night shift from 4:30 pm till 1:30am shift so I had to waitress and bartend. Towards the end of my time there the owner rented the upstairs to a Mexican resturant and I do believe it was the first location of the Cosmic Cantina. Does anybody out there know if I'm right? I actually received a very touching email from a man who recognized the picture as his wife, now deceased. Thanks for all of the additional information. The Ivy closed right before my time, but I don't believe Cosmic Cantina was there. I do know that the Cosmo(politan) tap room was upstairs during the 70s, perhaps later. I remember this building as mostly vacant, except for Pizza Hut, until recently, and I remember Cosmic Cantina as opening on Perry Street around 1997-98, originally with the Lounge downstairs. The Cosmo Room (aka Cosmopolitan Tap Room) was upstairs into the early 1980s. Then the upstairs space became another bar/restaurant called Val's Upstairs (run by a friend of my father's). I think it lasted a while after the Ivy Room closed, but it went out of business sometime during the mid-to-late 80's. As a late 1980s Duke graduate, I have many fond memories of nights spent at Val upstairs! It is fun to read about the history of my beloved haunt! I well remember going in very often to just order a cold turkey sandwich and cold beer. It was the best bread and sandwich in town and sometimes I would take a date in at night because it was so comfortable. As downtown's beloved Jo and Joe's closed this weekend, it seems fitting to recall a previous lost love - the Ivy Room. 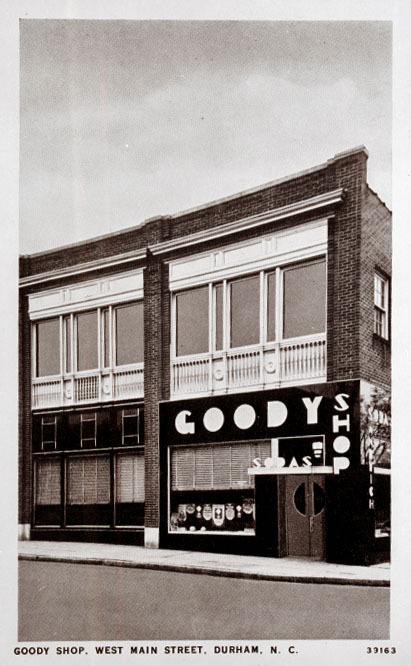 The building at 1000 West Main Street was built in the 1930s and originally occupied by "The Goody Shop" (in the eastern portion) and "Pender's Stores" - a grocery - in the western portion. However, from sometime in the 1940s, the middle portion of the building, and later the eastern portion, was occupied by The Ivy Room. Ivy Room, 1980, with the "Cosmo Room" upstairs. I believe that the Ivy Room closed on May 19, 1985. For a number of years, the eastern portion housed a Pizza Hut delivery business (thus the red awnings.) The building has sat vacant for quite a few years now, serving as the demarcation between the Life (Brightleaf) and Death (funeral homes and vacancies) portions of West Main. I never knew the Ivy Room - it closed just a few years before I first came to Durham. But from what I've heard/read, it had an ability, much like Jo and Joe's, to appeal to many different people - the longtime staff took a personal interest in those who came in, and it cultivated a devoted group of regulars. This building was purchased in 2007, gutted, and renovated - it appears to be for lease for the first time in a very long while. Wait... Jo and Joe's closed? Wow, that is really sad. Cool post and cool site.